There are, in effect, two War Memorials commemorating the men of Kenton who died in the 1st World War - 1914 - 1918. The Memorial in the Church bears 18 names while the stone Memorial on the Green in the centre of the village has 14. 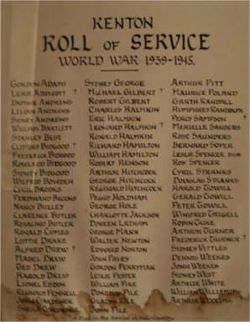 The Church also displays a Roll of Honour containing the names of 80 men and women who served in World War 2, on which the names of the 8 men who died are marked with a cross. (This Memorial has been damaged by damp). 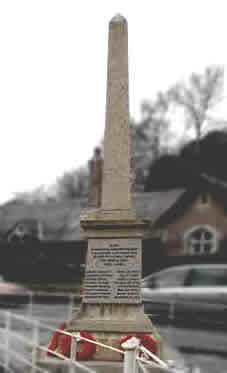 The Memorial in the centre of the village consists of a square block of polished marble topped by an obelisk, the whole standing on an ornate plinth. The names appear on three of the faces of the central block, the fourth face being blank. There are some discrepancies between death dates shown on the memorial and those given by the Commonwealth War Graves Commission. Stoker 1st Class Walter Lamacraft of the Royal Navy, HMS Goliath. Son of Joseph and Lydia Lamacraft. Born in the December Quarter of 1878 in Kenton. Died 13 May 1915 aged 36. Private Walter Carby (or Carbie) Greenslade of the 10th Battalion, the Hampshire Regiment. Son of Sydney and Mary Greenslade. Born in the December Quarter of 1885 in Chulmleigh. Died 10 August 1915 aged 29. Lt.-Col. John Henry Beer of the Royal Berkshire Regiment. Son of William and Louisa Beer of Willsworthy, Kenton. Born in Kenton in 1879. Killed in action 29 July 1916 aged 36. Served with the Imperial Yeomanry in the South African Campaign. Believed to be Private Ernest Quick of the 14th Battalion, the Gloucestershire Regiment who died, not on 24 November 1916 but on 15 November 1916. This man's link with Kenton is not yet known. Private William John Andrews of the 9th Battalion, the Devonshire Regiment. Son of John and Elizabeth Andrews of Kenton and husband of Adelaide Ellen Andrews of High Street, Kenton. Born in 1881. Died 26 December 1916 aged 35. Private Bertie Rice of the 1st Canadian Mounted Rifles. Son of George and Mary Rice of Shutterton Cottage, Starcross. Born in the March Quarter of 1888 in North Tawton. Died 25 June 1917 aged 28. Held Canadian Citizenship. Private Frank Henderson of the 2nd Battalion, the Devonshire Regiment. Ward of William Heppell of Church Stile House Industrial School, Exminster. Born in the March Quarter of 1895 in Wellington, Somerset. Died 24 July 1917 aged 21. Captain Frederick George Causley of the 7th/8th Battalion, the King's Own Borderers. Son of Albert and Elizabeth Causley of 43 Regent Square, Heavitree, Exeter and husband of Margaret Causley. Born in the March Quarter of 1891 in Kenton. Died 31 July 1917 aged 26. Awarded the DCM (Gazetted 10 March 1915). Lieutenant Harold Vaughan, Adjutant of "A" Battery, the 74th Brigade of the Royal Field Artillery. Son of Lt. Col. Edward H. Vaughan and Katherine C. Vaughan of "Penhayes", Kenton. Born in the June Quarter of 1877 in Kenton. Died 31 July 1917 aged 40. Able Seaman James Rice Clarke of the Royal Navy, HMS Defiance. Son of John Clarke and husband of Louisa Clarke of 28 Brook Street, Dawlish. Born in the June Quarter of 1880 in Combe-in-Teignhead. Died 3 August 1917 aged 39. Buried in Kenton Churchyard. Private Thomas Edward Lovell Whitton of the 1st Battalion, the Wiltshire regiment. Son of Edward and Mary Whitton of Kenton. Born in the December Quarter of 1898 in Kenton. Died 25 August 1918 aged 19. Private Harold Bernard Ralph Elliott of the 7th Battalion, the King's Shropshire Light Infantry. Son of Edwin and Isabella Elliott of High Street, Kenton. Born in the September Quarter of 1899 in Kenton. Died 2 September 1918 aged 18. Private Albert Edward Bricknell of the 1st/5th Battalion, the Devonshire Regiment. Son of Samuel and Sarah Bricknell of the Butcher's Shop, 2 Church Street, Kenton and husband of Sarah Bricknell of the Dolphin Inn, Kenton. Born in the December Quarter of 1880 in Kenton. Died 6 November 1918 aged 38. Private Leslie C. Anning of the 95th Battalion, the Training Reserve. Born in Ashcombe in 1899. Died 11 May 1917. Buried in Kenton Churchyard. Captain Charles Guy Bramwell of the 8th Battalion, the Cameronians. Son of the late T. W Bramwell and Mrs. Bramwell and husband of Joan Bramwell, of Brookfield, Blagdon Hill, Taunton. Died 28 June 1915 aged 35. Private Charles J. Paul of the 60th Battalion, the Australian Infantry. Died 5 September 1918. He held Australian Nationality. Steward Francis George Strawbridge of the Mercantile Marine Reserve, HMS Clan McNaughton. Born in Up Ottery in 1888. Died 3 February 1915. In grateful remembrance of those from this Parish who in like spirit fell during the World War 1939 - 1945"
Private Leslie Thomas Addicott of the 6th Battalion, the South Wales Borderers. Son of Edwin and Edith Addicott of Kenton. Born in the December Quarter of 1911 in Kenton. Died 29 April 1945 aged 33. Private Clifford Reginald Bidgood of the Royal Army Medical Corps. Son of Robert and Mildred Bidgood and husband of Muriel Elizabeth Bidgood of St. Thomas, Exeter. Born in 1922. Died 9 July 1945 aged 23. Buried in Exwick Cemetery, St. Thomas, Exeter. Private Alfred Drew of the 1st Battalion, the Devonshire Regiment. Died 11 April 1944 aged 36. Sergeant (Pilot) Michael Sydney Gilbert of the RAF Volunteer Reserve. Son of Sidney and Helen Gilbert of Kenton. Born in 1923. Died 30 October 1942 aged 19. Buried in the churchyard at Powderham. Leading Aircraftsman Leonard Martin Halmkin of the Royal Air Force. Son of Alfred and Alice Halmkin of Kenton. Born. Died 3 August 1941 aged 20. Stoker 1st Class Percy Charles Sampson of the Royal Navy, HMS Orion. Son of Charles and Lily Sampson of Kenton. Born in 1920. Died 29 May 1941 aged 21. Private Frederick Turner of the 13th Battalion, the King's Liverpool Regiment. son of Jesse and Edith M. Turner and husband of Joyce Turner of Kenton. Born in 1921. Died 9 March 1943 aged 22. Captain Arthur Branscombe Wood of the 4th Regiment, the Royal Horse Artillery. Son of Arthur and Mary Wood. Born in the June Quarter of 1908. Died 23 November 1941 aged 34. Awarded the Military Cross.